Craftshop is one of the several FarmVille crafting building that was introduced in 2011. This building can craft items that can be use in your farm either for decorations or farming equipments and goods. The recipe in the craftshop needs some farm products (eg. Milk Jug from Cow Pasture, Manure Bag from Pig Pen, Apple Wood Basket from harvesting Apple Tree, Wool Bundles from Sheep Pen, Cheery Basket from harvesting Cherry Tree) and bushels in order to create the item. You can collect bushels from harvesting certain crops. Crafting more items will let you gain mastery star and you can reach up to 10 star mastery. 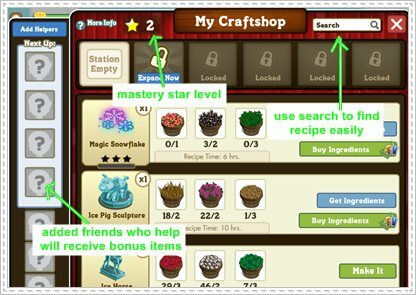 Achieving certain mastery star level let’s you unlock more crafting recipes. 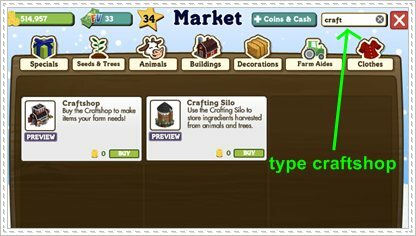 You can purchased a Craftshop at the market for 0 coins. You don’t need materials to finish it. You can already craft items once you place it in your farm. However it require materials in order to upgrade it. It can be upgraded up to stage 6. Each upgrade will open up additional one station so you can craft another items simultaneously. You can ask your friends for help to speed up the crafting process. You will need the following materials to upgrade you Craftshop. Head to our Materials Gift Link page if you’ll need to ask your friends for these materials. Hi i want to know what treat not dog treat the other one treat like in hearts what for is this?